Two of the three paintings I entered in “Spirit of the Horse” to be held at the Palos Verdes Art Center, have been accepted. 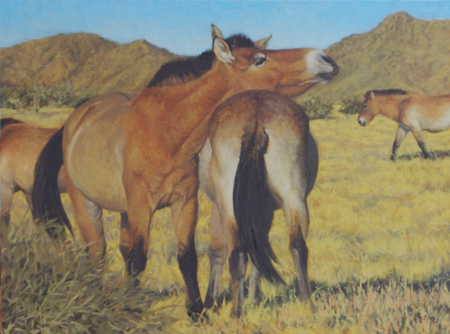 One is “Takhi Stallion and Mare”, part of which forms the masthead for this blog. The other is “That’s the Spot!, see below. It was painted from reference that I shot at Khomiin Tal in western Mongolia during my September 2006 trip there. Due to gas prices and the slowing economy, at least in California, I have pulled out of the Los Altos show in July. I will be participating in the 10th annual North Coast Open Studios June 7-8. Please stop on by, I’d love to see you. I’ll have original paintings, prints and cards available, plus the garden is starting to look pretty good. The following weekend, I’ll be at the Marin Art Festival. I think it’s going to be a whole lot of fun and it’s almost two hours closer to me than the Los Altos event. My gut feeling said pull out of the first, but don’t pull out of the second. I recently realized how important it is to listen to that inner voice. I was invited last year to participated in the art show at the Grand National Rodeo and Horse Show. I had some reservations from an animal welfare standpoint, but decided that I would send five paintings and attend the opening weekend to judge for myself whether or not this is an appropriate venue for me. That decision will have to wait, since, to make it short, the show was such an unbelievably incompetent mess at so many levels that I ended up crating up my work and pulling out. Yup, loaded it back in the van and brought it home. Most of the other over 100 artists, including some from England, Australia, Italy, Belgium and Canada, weren’t so lucky. I am participating in a private forum that was set up to sort this out. As of this morning, over six weeks after the close of the show, many of the artists have not gotten their work back. At this point, work is finally starting to move out, but only because of relentless effort on the part of the management of the Cow Palace. A fair amount of what has been returned is dirty, damaged or not in the containers it was sent in. And a lot of those were expensive Air Float boxes, which are to regular cardboard boxes what real cheese is to Velveeta. In some cases, art was removed from the Cow Palace against the express, specific wishes of the artist. The “directors” of this show have, IMHO, lied to, misled and otherwise conned all of us. As of today, none of the three has given the slightest sign of a clue that they have done anything wrong. It’s everyone else’s fault. The stories and excuses change almost hourly. IMHO, do not, under any circumstances, get involved with anything that they are in charge of. If you are an artist who sent work to the 2008 Grand National Art Show or joined the Grand National Artist’s Society, you need to email Tami at artenow@gmail.com immediately. Do not join The Grand National Artist’s Society. Do not participate in the art show at the Santa Barbara Fiesta until you have confirmed that none of the people who created this mess are involved. I visited the Fiesta website and it looks like a great event that you should consider if you live down that way! I am not going to publish names here. Please contact me through my website if you need more specific information. As we are all learning, what goes on the web, stays on the web. Forever. If I hear of anything else, I’ll post it here. Our doggy guest has moved on and very probably has a forever home already waiting for him with someone who had to recently put his 14 year old longer haired shepherd to sleep. Pet overpopulation is a myth. The homes are out there, but sometimes it takes patience and some effort.